I’ve recently shared a desktop tool WebShot – Desktop Website ScreenShot Tool, but that was compatible only with Windows OS, and Google Chrome the latest version supports Extensions and some very good extensions are available and I stumbled up one such extension WebPage Screenshot that works as a perfect alternative to WebShot as this is browser extensions and should work on any platform Google Chrome works on. 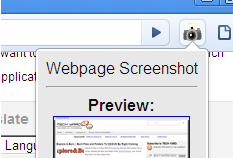 Webpage Screenshot is Google Chrome Browser extension that can capture and save the whole webpage even long pages as a single image.The screen shots can be resized in terms of percentages before saving, the screenshot of the webpage.Screenshots of webpages can be saved in PNG format. On installation the extension places a new icon ( camera ) beside the address bar, just click that to take a screenshot of the webpage and press “All Page Screenshot”. A preview of the image is show, next click “Click here to open image” in the preview box. Choose the zoom percentage and then right click on the image and select “save image”. 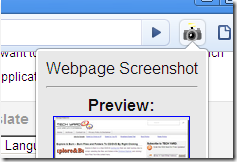 If you are Firefox user you can try Fireshot – firefox screen capture addon. for me its fireshot in Firefox, Chrome rarely using.